Monica Lewinsky. Paula Jones. Juanita Broaddrick. Kathleen Willey. Gennifer Flowers. While many Americans of a certain age know these names quite well, most people (including nearly all younger Americans) would not be able to instantly identify them. But all of them (and more!) have been linked to Bill Clinton in one way or another. 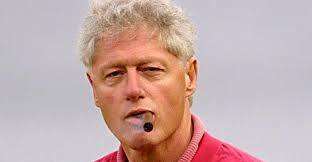 Clinton’s dalliance with Lewinsky (a young White House intern at the time) prompted a coverup that had Clinton perjuring himself, thus becoming the first elected president ever to be impeached. Paula Jones said that Clinton sexually harassed her when she was an Arkansas state employee and he was governor. As part of a settlement of the allegations. Clinton paid Jones $850,000. To this day, Juanita Broaddrick insists she was raped by Clinton in 1978 when he was campaigning for governor of Arkansas and she was seeking to be a campaign volunteer. Kathleen Willey is a former White House aide who says that Clinton groped her in his office in 1993. And Gennifer Flowers, a model and actress claims she had a long term affair with Clinton. Originally denying the affair, Clinton was later forced to admit a sexual encounter with Flowers. Both the Flowers and Lewinsky hookups followed the same pattern: at first, Bill Ciinton originally denied the affairs and then later acknowledged these sexual relationships. And there are other names. Dolly Kay Browning, a former high-school friend of Clinton’s who claims they had a 22-year off-and-on sexual relationship. Elizabeth Ward Gracen, a former Miss America who said she had a one-night stand with Clinton when he was governor. Myra Belle “Sally” Miller, a former Miss Arkansas who said she had an affair with Clinton in 1983. And through all this, Hillary Clinton has defended her husband again and again even though it is now well-known that he conducted such relationships while married. At times it seems Mrs. Clinton has blamed just about everybody but her husband. She blamed her troubles on a “vast right-wing conspiracy.” She blamed special prosecutor Kenneth Starr. She blamed the media. And Monica Lewinsky and others have said that Hillary repeatedly blamed “the other woman” (apparently, no matter who the “woman” was) for Bill’s troubles. So, as far as anyone can tell, Hillary gave Bill a pass. And it’s a pass she’s tendered more than once. In fact, you might say she’s acted, at the very least as an enabler. And that’s what much of the fuss is about lately. How can you be a champion of women and their rights while allowing your husband to seemingly violate those rights in the most invasive ways? And how can you not only allow all this but excuse it and actively defend the alleged predator when you’re not looking the other way? Those who never heard the full story of Bill and Hillary’s apparent “teamwork” in these matters need to know. And those who have forgotten need to be reminded. For these are very real and very legitimate concerns – especially now.